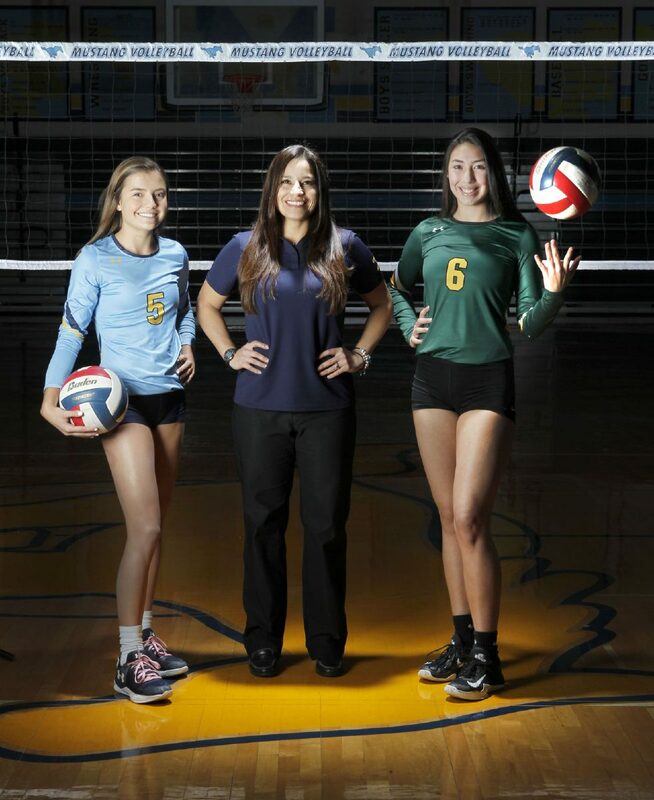 Newcomer of the Year Sydney Marburger, All-Area-Coach of the Year McAllen Memorial Lorena Lopez and Player of the Year, Nikki Rowe, Jackelyn Alanis at McAllen Memorial on Monday Dec.11,2017, in McAllen. The first and second teams plus the final top 10 from the 2017 volleyball season. Kristi Gomez, PSJA Memorial — The senior outside hitter makes her second consecutive appearance on the All-Area First Team after leading the Wolverines to their first district title in school history. Jocelynn Everage, McAllen Memorial — The junior outside hitter led her team with 408 kills and 43 blocks while finishing second in digs (268). Audrey Smith, Sharyland Pioneer — Smith, who will graduate and continue her volleyball career at Texas Tech next fall, was also named as District 31-5A’s Outstanding Setter this season. Lexi Gonzalez, McAllen High — The middle blocker showed off her versatility during her sophomore season, finishing first on the team in blocks (70), second in kills (266) and third in digs (146). Jackie Howell, Mission Veterans — The Patriots junior hammered home 515 kills, 345 digs and a team-high 77 aces this season. Tianna Howard, Edinburg High — The four-year letterman was named District 31-6A’s Outstanding Hitter of the Year, racking up 359 kills in 14 district games. Bianca Cortez, Edinburg Vela — The SaberCats’ senior finished first in kills (363) and blocks (198) as a captain of a young team. Mikayla Zimmerer, Sharyland Pioneer — Zimmerer followed up winning the All-Area Newcomer of the Year award in 2016 by spearheading the Diamondbacks with 379 kills and another area-round playoff appearance. Makenzie Gerlach, Mission Veterans — The junior went for 388 kills, 284 digs and 47 aces during a 31-win season for the Patriots. Nicole Rodriguez, Donna High — The 5-10 middle blocker was a first team all-district performer with 196 kills, 32 aces, 143 blocks and 69 digs. Adriana Martinez, McAllen Rowe — The senior compiled 1,033 assists and 414 digs on the Warriors’ run to the Sweet 16. Carter Helmcamp, McAllen High — The UTRGV signee was third on the team in kills (258), second in aces (42), second in blocks (45), fourth in digs (142) and tops in assists (449).